Cross section against outer ducts and the outer surface of the inner ducts, and basic engine cases and bearing operation, form the annular duct air passage for fan discharge air to flow to the rear of the engine. Cross section against four turbine rotors stages: a single stage which drives the rear (high pressure) compressor rotors and a three stage unit which drives the front (low compressor rotor and bearing operation. Cross section front compressor to rear compressor rotor. 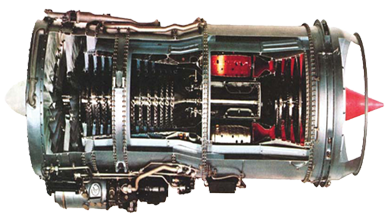 The front compressor (N1) is driven by the second, third,and fourth stage turbines through the front compressor driver (long) turbine shaft at N1 rotation speed and bearing operation. Cross section against the combustion chambers number four and seven chambers have spark igniter bosses including spark plug, exciter and harness. Starter motor turns freely to demonstrate phased operation of compressor and turbine. Fuel control unit to demonstrate engine rigging. Complete cross section of pipe lines for fuel system, oil system, and pneumatic system to demonstrate flow operation of those systems.